Since 1937, when we introduced our first detector tube, Draeger has been the world leader in the detection and analysis of gases and vapors in the industrial workplace. Our leading edge technology has kept us in the forefront of advancements in monitoring breathing air in the high and low pressure ranges. Draeger has expanded its line of Aerotest products for a wide variety of applications. For low pressure compressed breathing air, Draeger still has the time-tested Aerotest Type A. To save time, Draeger has introduced the Aerotest Simultan Alpha. This product can simultaneously measure Oil, CO2, CO, and water vapor for low pressure units. For high pressure, the Aerotest Simultan HP can be used to simultaneously measure the same contaminants as the Alpha. A very similar application has been produced for the US navy called the Aerotest Navy. It meets the special requirements of the US Navy. Draeger has created a line of specialty Aerotest systems for the health care, utilities, beverage, and other industries. These include the MultiTest, Aerotest Light SF6, and Simultan Test CO2. All of the Aerotest systems provide fast and accurate results while still meeting the specifications of air purity standards. Standards such as CGA Grade D and E, DIN 3188, NFPA 1500, CSA Z180.1-M85 and EN12021 can be fulfilled. The Aerotest kits come with a certificate of conformance for either the flowmeter or the reducer's flow rate depending on your particular kit. 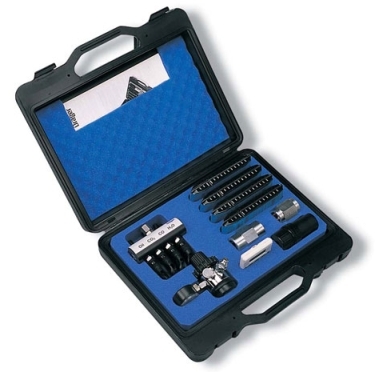 Aerotest Type A - The Aerotest Level A is the basic low pressure compressed breathing air kit. Includes Draeger-Tubes, tube opener, tube holder, flow meter, timer, quick-disconnect hose, carrying case, and instruction booklet. Aerotest Simultan Alpha - For simultaneously measuring contaminants found in low pressure applications. Includes Draeger-Tubes, tube opener, measuring device for tubes, timer, quick-connect coupling, pressure reducer, carrying case, and instruction booklet. Aerotest Simultan HP - For simultaneously measuring contaminants found in high pressure applications. Includes Draeger-Tubes, tube opener, measuring device for tubes, timer, HP pressure reducer, CGA 347 male and female adapters, carrying case, and instruction booklet. Aerotest Navy - The Aerotest Navy is designed for the special demands of military applications. It is a new development in Aerotest technology developed in conjunction with the US Navy. Includes Draeger-Tubes, tube opener, measuring device for tubes, timer, HP pressure reducer, CGA 347 male and female adapters, accuro Pump and spare parts kit, carrying case, and instruction booklet. MultiTest - The MultiTest analyzes the contaminant concentration of compressed medical gases in gas supply systems. Simultan Test CO2 - The Simultan Test CO2 is used for monitoring Carbon Dioxide (CO2) in the low pressure range. Includes Draeger-Tubes, flow meter, accuro Pump, tube opener, carrying case, and instruction booklet. Aerotest Light SF6 - The Aerotest Light SF6 is used for checking the quality of SF6 gas in gas shielded switchgears in power and industrial plants. Includes Drager Tubes, flow meter, accuro Pump, tube opener, carrying case, and instruction booklet.